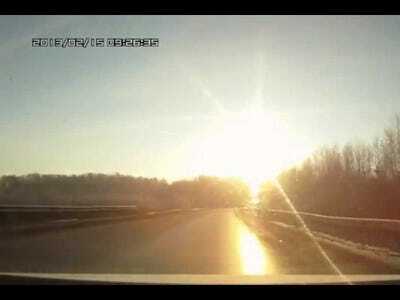 An enormous meteor exploded over Russia today, injuring hundreds of people, and within hours tons of videos of the event had been posted to YouTube.So many were filmed by dashboard cameras, it seems every driver must be filming his every move. In a June 2012 post on Animal, Russian ex-pat and journalist Marina Galperina offered a few reasons, which boil down to dangerous driving conditions and the unreliability of Russian traffic police. Addressing those high levels in 2009, President Dmitry Medvedev blamed the “undisciplined, criminally careless behaviour of our drivers,” along with poor road conditions. That is not hyperbole. Russia ranks 133rd among the world’s nations in corruption (where number one is the least corrupt), according to Transparency International. Much of that corruption is on the part of the traffic police, an institution that, along with kindergartens and higher education, was ranked by Russians as the country’s most corrupt. In a recent poll, 32 per cent of Russians surveyed called traffic police the most corrupt institution. So going to the police with a legitimate complaint is far from sure to produce a good result. In addition to authorities they deem untrustworthy, Russian drivers must contend with the possibility of being attacked by another driver. The below video compiles fights between drivers that feature crowbars, slapping, punching, and worse. Then there are pedestrians who get themselves hit by cars on purpose, for a payoff. A video compilation (below) of failed scams offers a few examples. Overall, in a country where traffic conditions are horrible, insurance scams and roadside fights are always a possibility, and the police are widely viewed as corrupt, video evidence of one’s innocence can be a very valuable thing.